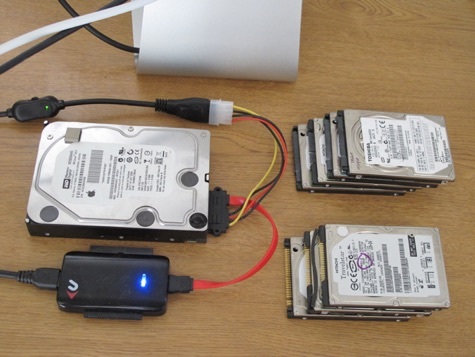 There are any number of scenarios in which it is necessary to connect a bare—which is to say uncased—previously internal hard disk (HDD) to your Mac so that the data on the HDD can be retrieved, edited, or have new data added alongside. The NewerTech Universal Drive Adapter makes that possible. A typical real world scenario that occurred during this review was my iMac had a fried logic board. A shiny, new iMac arrived from Apple, but years-worth of user data was on the bare HDD that was retrieved and returned by the local Mac tech shop. Replacement logic boards are no longer available from Apple for an iMac that had given seven years of sterling service. Vital data from the wreck was on a cased backup drive, but what about all that non-vital, but possibly even more useful optional data? How is a person to know which is which until the occasion arises? Restoration from an active working disk seems a much better bet. External HDDs usually go into cases and sit neatly and prettily on your desktop, preferably plugged into whichever is the fastest port on your computer. Recent Macs have Thunderbolt and USB-3 connections; many older Macs have FireWire-400 or 800 with USB-2 or even USB-1. Enter the NewerTech Universal Drive Adapter (product webpage) or UDA, a simple kit that will allow you to connect almost any bare drive as an external storage solution! Advertised at $39.99 on the manufacturer’s website, you will no doubt be delighted to discover on clicking the Other World Computing (OWC) tab on the product page that the asking price is $28 with shipping starting at $5.79. An optional carrying case and two sizes of drive protectors are also available. Out of the box you receive the adapter (top left) with a power supply and various connection cables. The jargon—three HDD sizes and three types of drives—may seem daunting. IDE/ATA/ATAPI or IDE/ATA or SATA—huh? As your eyes glaze over all you need to do is look at a single visual sheet and match the connections carefully by eye. It’s one of those tasks that makes sense as you handle and interact with the parts that you are using as you go along. Patience is a virtue. Transfer speeds are mostly irrelevant in this context. The UDA will connect to all three speeds of USB. Suffice it to say that you need to allow plenty of time if you are doing a data migration from a 500GB or 1TB HDD at any USB speed. Be reassured that it will happen reliably if you proceed carefully. If you own or need access to bare drives then you need one of these.